And the answer is? 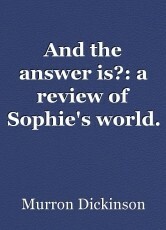 : a review of Sophie's world. Who are you? Where does the world come from? Just a few of the questions posed in this masterpiece of writing. And the answer is? : A review of Sophie’s world. Have you ever considered the world around you, precisely where that world came from, what particles make up our world and where you fit within it? Sophie certainly hadn’t thought about any of these questions when she returned home from school one afternoon to find a couple of letters in her letter box – both addressed to her. These letters ask two questions that may seem simple upon first glance. Who are you? And Where does the world come from? These questions set off a chain of many other interlocking philosophical questions that lead Sophie down the path of philosophy and its history. When she receives yet more letters in the post, each one containing pages that detail the thoughts, theories and projects of the various philosophers throughout history, Sophie begins to realise that her world is much more complicated than she had thought. Sophie is taken on an adventure without leaving the safety of her own garden, into a world where religion and the Gods is proved and then disproved before being proved once more. She is told of the theories of philosophers from Greece up to the modern era and she finds out precisely what atoms are, why the elements are so important and the questions regarding life after death. This book is truly a fantastic work of philosophical fiction. I have always been of the opinion that a good story is a piece of writing that changes you once you have read it. I can safely say that this book does exactly that. One is compelled to turn the pages and find out exactly what philosophy has taught us about the world that we live in. I have learned so much from this book. At times, this book does pose slightly uncomfortable questions and asks the reader to think over their perception of the world. The reader, along with Sophie is asked to question their beliefs and wonder how much of what we learn is true. However the uncomfortable questions are worth while as when one reaches the end of the book, one feels considerably more enlightened about life and its many questions. I would recommend this book for anybody who is interested in the meaning of life and its many philosophical answers. This book taught me so much and I do believe that I will now be able to see the world in a new light from this day forward. © Copyright 2019 Murron Cain. All rights reserved. This page was created in 0.3164 seconds.